Mixing spoons. They come in all shapes and sizes, which one is the best? Why can't you just use a regular spoon? Well actually, there's no reason why you can't, or simply use a clean stick for that matter! So what's the difference between the spoons already in your drawer, the $7.99 jobber in your liquor store, and the $20+ boutique offerings? A lot of it does boil down to personal preference and style, but there are important differences. I like to think of it as having "the right tool for the job". When it comes to finely crafted cocktails, every element comes into play in terms of the success of your final result. It may be a law of diminishing returns, but why wouldn't you push this art to the limit given the opportunity? The best advice for home bar tending has always been and still remains, "Build your collection one drink at a time". The tools for mixing great cocktails vary depending on the particular style of drink you are creating. Have a favorite? Learn everything about it so you can make it well. The Internet is an amazing resource! Get to the best place you can, sit at the bar and talk to the people making the drinks. Let them introduce you to something new and enjoyable based on what you already like. Once you find things you really like, learn how to re-create them at home, but do this one drink at a time. That drink will most likely be "stirred" or "shaken" (or built in the glass). I'll deal with the variety of things you can use as a mixing glass and shaken drinks later. This posting is about stirred drinks and more specifically, what they are stirred with. Balance, weight, grace, ease of use...these are all things a great bar spoon should possess. Yes, a teaspoon can probably do the job of stirring the drink you built in your old-fashioned glass. If you are properly mixing a "stirred" drink however then you should at least be mixing in a separate glass with ice and straining the resulting liquid into a new glass with fresh ice or into a chilled cocktail glass. Don't fill the glass with ice, you just want a little more ice than liquid, usually about half full. When you are stirring you want to slide the spoon down into the ice carefully and push the spoon away from you then back in a steady motion. As you stir, try not to let the ice collide too much with itself or the sides of the mixing glass which ends up breaking off small pieces of ice and over diluting your now only near perfect creation. The whole point here is to chill the ingredients and to add a certain element of dilution at the same time to create balance in your drink. There are certainly people on both sides who would argue strongly and endlessly about why you would want anything from zero dilution to not worrying at all about over-dilution. It's hard to argue with the results of gently treated clear and cold hand-cracked ice for mixing, which is how I like to roll. Try for a "quiet stir" and give it all your concentration until you are finished. Generally, a count (to yourself of course) to 50 will provide a long enough stir the achieve the desired results. There is a mysterious alchemy that occurs in the mixing glass. The idea is to fold the ingredients together without too much aeration. If you wanted to break up the surface tension of the different and sometime hard to mix liquids to create thousands of air bubbles then you'd be shaking your drink...but that's a different story. When you stir you are fusing together all the little molecules hanging out side by side in the glass and with as little violence as possible so that you have a nice clear liquid in the end. Maybe now you're starting to get a sense as to why professional bartenders shell out big bucks for a quality mixing spoon. Here are a few examples of some of the "tools for the job". This spoon's drilled holes make it well suited for fishing out garnishes like cherries, olives or onions. 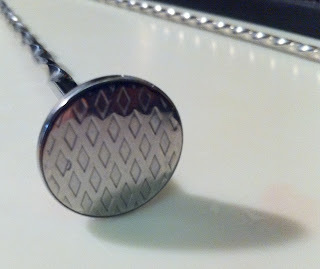 The ball on the reverse makes it well suited for quick stirs as well. The twist is coarse and ornamental at best yet still somehow still creates a balance point that you could use in a mixing glass to create some extra swirl. Note the construction and the coarse weld of the spoon onto the rod. The next spoon I found on Amazon. I've read that this style originated in the old drug store/soda fountain culture and that the flat end was designed to crush pills. 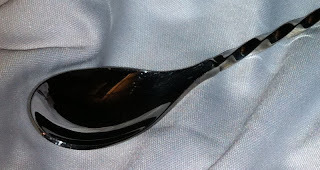 The flat end of this spoon which was originally designed for crushing pills works great for crushing sugar cubes. This spoon is particularly effective when mixing drinks with sugar, especially when using a sugar cube. The serrated edge on the spoon also helps with these type of drinks. The serrated edge helps with mixing sugar and spices. This is a longer spoon that my first and has a full twist along the shaft, but the twist here seems oddly non-user friendly. 30 cm Japanese teardrop on top vs. 27 cm Rx on bottom. There is a weird spot in the middle where the twist gets closer together. It's mostly non-functional as an aid to stirring and the balance point seems to be at the bottom of the tight coil area. More of a specialized spoon for building an old fashioned cocktail and it's ilk than a good all-round mixing spoon for certain. With the more pedestrian choices explored I decided to jump up into a new price range. Today's pros all use this stuff so I figured there must be a reason. I picked up these 2 spoons at the same time from the good people at Cocktail Kingdom. 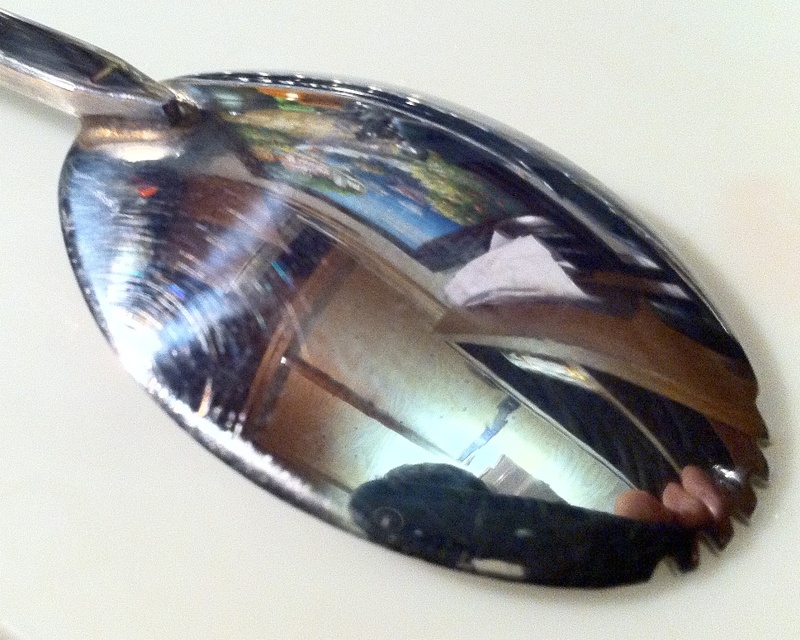 A 24 cm Japanese trident spoon and a Japanese 30 cm "teardrop". When I received them I remember thinking they were so light they felt like toys compared to the spoons I had been using. 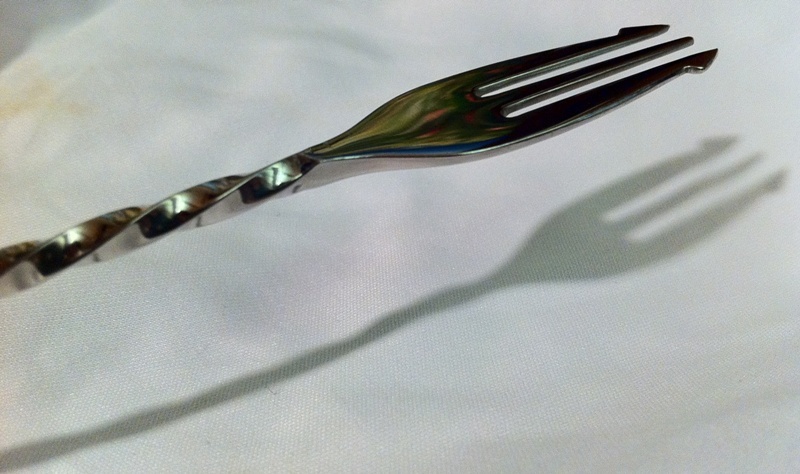 Soon I realized the lightness also came with incredible balance. Slipping one of these spoons into the mix was like the difference between a butter knife or a new Henckels blade through a steak. I'll start with the 30 cm teardrop since I use this one the most. This spoon literally shines in a side-by-side comparison with normal bar spoons making the others look dull and clumsy. Though longer than the first 2 spoons in the collection this weighs in 6 grams lighter than the 24 cm spoon and 10 grams lighter than the 27 cm spoon. The spoon and twisted rod seem to be all one piece the welds and finishing being of so high a quality. The tight twist on this spoon works with your natural motion and makes stirring so easy it's almost like it's doing the work for you. The welds are thoughtful and well finished giving the appearance of one solid piece. I've found that this spoon is a perfect match for the unbeatable Yarai mixing glass, which I'm sure to rave about when it comes time to post about mixing glasses. The spoon works well with just about any glass but when using with that particular glass it's like they were made for each other. The 24 cm trident, though the same length as my slotted spoon weighs on 22 grams as compared to the slotted spoons 40 grams (45% less!). The trident end not only works well for fishing out garnishes and slipping into glasses crowded with ice, it also provides quite a light show! Whether in the glass swirling around or on top using the spoon end to swirl, there's something memorizing about the way the trident flashes in the light. This is my "go-to" spoon for measuring and mixing when I'm building a drink in the glass or pre-mixing ingredients in a shaker. The small size works great in the confines of a glass and the balance is amazing, it's really a joy to use. Especially after getting used to inferior equipment. A word of caution however, if you get one of these, please treat with respect. More than one pro has ended up in the emergency room after accidentally slamming their hands down on the trident end! Of course, having a nice spoon is only 1 of the 3 pieces you need to mix drinks. You also need a mixing glass and a strainer so I'll be sure to post about those items soon. Stay tuned!